A delirious game of atmosphere to practice until exhaustion! Take your hands out of your pockets, get into the dance and follow the tempo without lowering your guard! 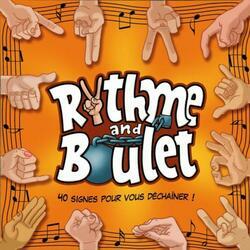 Rhythm and Boulet is a game where you will clap your knees and hands like Queen's We Will Rock You. From this rhythm, chanted by everyone, you will have to create a chain of signs. Each player called must repeat his sign before mimicking that of an opponent without delay. Sense of rhythm, vivacity and deceit will be your assets to avoid being the ball and chain's end!